Church confirmations. We don’t hear as much about this subject today as we did when I was young. Of course it depends on the denomination or religious group your family was associated with. Different groups, different traditions. The confirmation record I have featured today is for my husband’s mother, Dorothy B. Fink and her oldest brother, Elwood “Al” Fink. The two names were already circled when we located this record among Dorothy's belongings, after her death. The two siblings, who were one year apart in age, Al being the oldest, were confirmed on 28 March 1926. That would have made them 13 and 12 at the time of their confirmation. The confirmation program states that Rev. Paul Langhorst was the Pastor of the church. I have a lovely picture Al & Dorothy on the day of their confirmation. 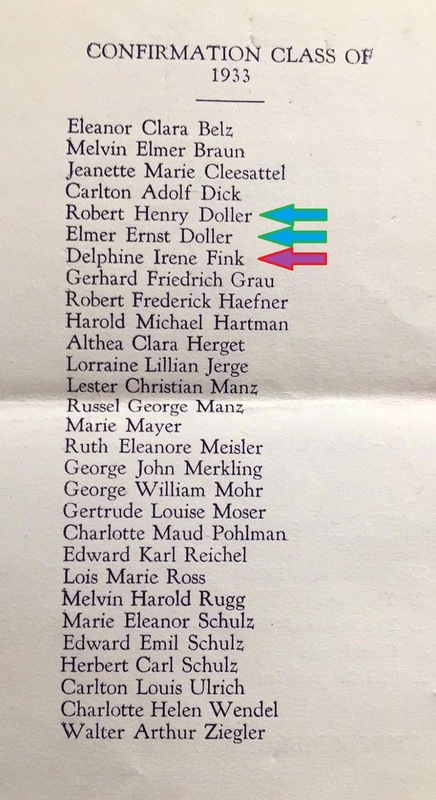 I don’t have any record of the confirmation of the two younger Fink siblings, Willard & Delphine. I should ask cousins Tammy or Tracy if they have those records. UPDATE - After I had already finished this post, I did hear from cousins Tracy and Tammy. 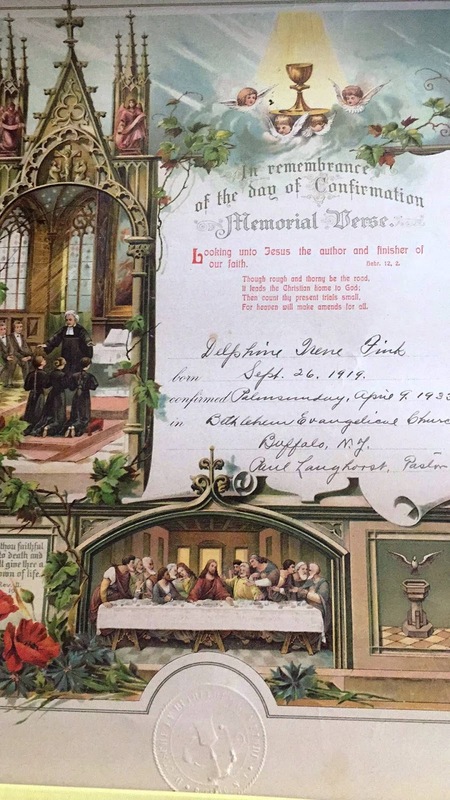 Tracy was able to provide the confirmation program and certificate for Dorothy & Al's little sister, Delphine "Honey" Fink. 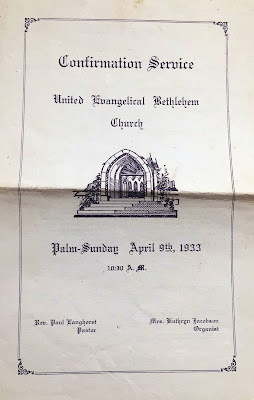 She was confirmed at the same church, by the same Pastor on Palm Sunday, 9 Apr 1933. 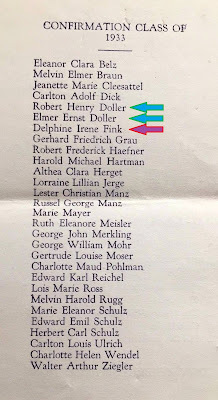 Of note: There are two other family names on the list of children being confirmed on the same day as Delphine. Elmer Ernst & Robert Henry Doller. These boys were 1st cousins to Al, Dorothy & Delphine. I do know that Uncle Al, whom I met in his later years, was a Christian man, who followed his faith. Dorothy and her husband, Gordon, joined a Methodist church in San Diego in 1956. I have Dorothy’s Bible here at our house. Delphine's Bible resides with her family. A little bit about Rev. Paul H. Langhorst. He was born 27 Jul 1881 in Ohio. His parents are both stated to be born in Germany (several census records give that place). According to his World War I draft registration card he was tall, with a slender build, brown hair and eyes. He married a woman named Emma before 1910 and they had several children. He was President of the New York District of the Evangelical Synod of North America. He was installed as the Pastor of the Bethlehem United Evangelical Church in Buffalo, New York on 22 Jun 1925. He died, according to a death notice published in The Newark Advocate, on 22 Feb 1945. Do you have church records for your ancestors? What do they tell you about their lives? I wonder, did the whole Fink family go to church every Sunday? As members of a church, would their be baptismal records available for all of the Fink children? I need to follow up on this.